Have you ever made something amazing in the kitchen that made you literally do a happy dance? This is happy dance evoking. I don’t really go to fast food places. I know that might sound a little blasphemous…like one of those people who say they don’t own a TV. Sorry, but it’s the truth. I do, however, see commercials for fast food (because I own a TV). Some of it catches my attention and I feel like I have to recreate it. 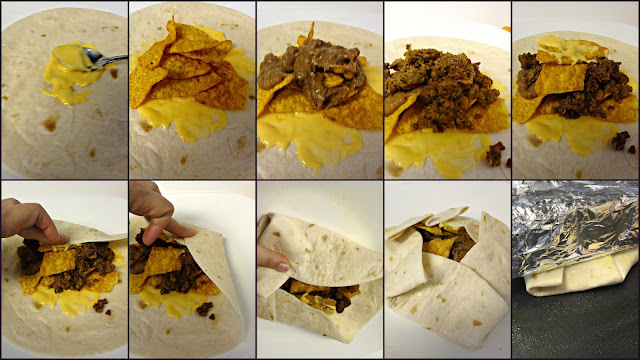 I’ve been making crunch wraps basically since they came out at Taco Smell Bell. They are more awesome when you make them at home, I’m sure (I actually don’t have anything to compare it to…never actually tried them at Taco Bell…hmph). Lately, though, I have been seeing the Doritos shell tacos commercials and I gotta say, “I wants it in mah belly.” Food cravings clearly make me talk like a crazy person. So, I thought: why not marry the two ideas and make a homemade Doritos Crunch Wrap?! You’re welcome, world. Ok, this is really super easy, and it is mostly about assembly. So let’s do this. Layer in the middle of your tortilla: Velveeta, then a layer of Doritos, followed by beans, meat and a couple more chips. Fold as shown in the diagram. Either grill it on a Panini press or use a griddle and an aluminum foil-wrapped brick like I did (I’m old school like that). Additional note–What makes this version better than Taco Bell’s is that you can modify it to your tastes and lifestyle. For instance, I made one with a low carb tortilla, lean ground beef, 2% Velveeta, fat free refried beans. Plus, whole ingredients (for the most part) make this a much fresher and satisfying meal than fast food choices. I dont like to eat at fast food places either. would much rather eat what i cook and know what ingredients are being used and who is making it! i will try YOUR version, since i wont EVER eat the one at TB!!! Thanks for sharing!! Love the pic tutorial!! Thanks, Laura, for the great comment. I would love to get some of those Doritos taco shells by themselves. I will NEVER try the TB version. Thanks for sharing, I will most definitely try this! ???? I’m kinda late commenting on this one, but AHHHH! Te amo. Taco Bell is my favorite gross fast food, and Doritos are my favorite gross snack chips. This is drunk food heaven.